So as I’ve mentioned in my ‘Oil Cleansing’ post, I’m all about natural products for my skin (as much as I can help it) and I took a personal oath to avoid drying soaps, face washes, and harsh cleansers for my face and neck from January 2016 onwards. A lot of older women I’ve spoken to with great skin have all told me that the key to stay wrinkle free and fresh faced as you age is to completely skip soap on the face and neck, and to moisturise the entire body and face every single day like it’s going out of style. I usually use Forest Essentials Cold Pressed Virgin Coconut Oil and warm water to cleanse my skin, but I have days where I’m just too tired, or too lazy to go through with the process (even though it only takes 10 minutes). 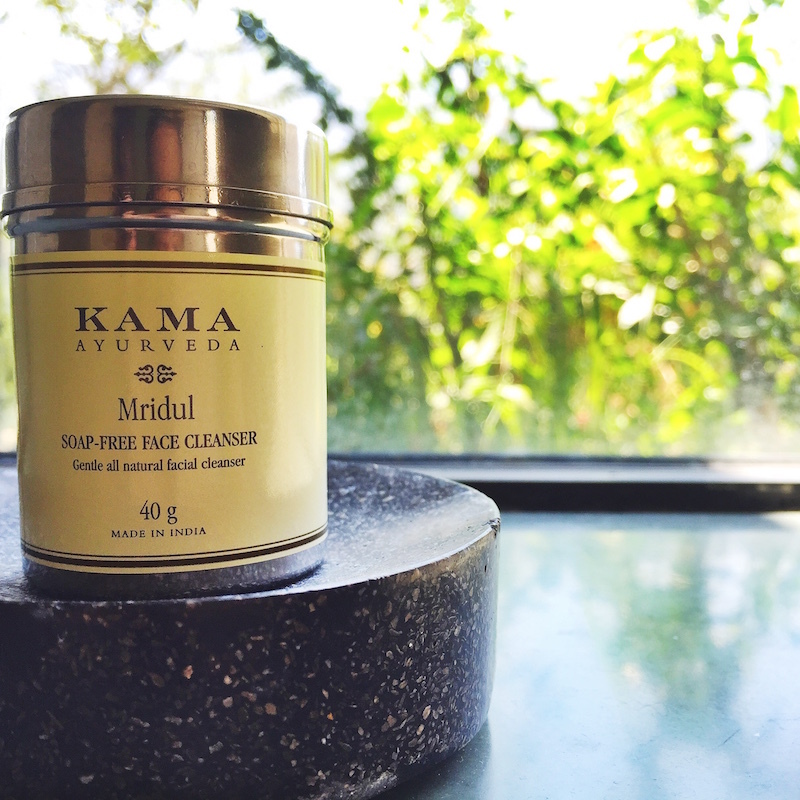 On these days I need something quick, simple, and soap free to clean my face of dirt, pollution and makeup; and in steps the Mridul Soap Free Facial Cleanser from Kama Ayurveda. Kama has been around since 2002 according to their website, but it popped up on my radar last year when I saw many seriously beautiful stores opening up in Mumbai and I was tempted to go in and take a look, having already been a fan of Forest Essentials and homemade beauty techniques. Kama Ayurveda is 100% organic and plant based, so this means no artificial colours, fragrances, animal products, urea, petrochemicals, glycol, or sulphates, plus they are cruelty free, so no animal testing (something I’m seriously behind). Their partner is one of India’s original Ayurvedic Institutions- the Arya Vaidya Pharmacy in Coimbatore and they ensure the highest standards and quality control. Ayurveda or “life-knowledge” has been around for centuries if not thousands of years in India, and basically looks to nature and natural substances for cures to various conditions. While a lot of it may not be authentic since it’s not considered an actual science, and people can basically sell whatever they want, I do believe that it works for skin care. Most modern beauty products have some derivatives of natural substances in them and will market natural ingredients on their packaging such as oatmeal, herbs, natural antioxidants, and extracts from various plants and flowers, but these are combined with a whole mix of chemicals and preservatives that negatively affect your skin over the years. The soap free cleanser from Kama has the following herbal powders- oatmeal, green gram, almond, neem, sandalwood, turmeric, camphor, chickpea, rose, and fennel. All of these are known to be miraculous for the skin; almonds for their vitamin E and fatty acid content, neem for battling acne, turmeric for disinfecting and cleansing, oatmeal to soothe, sandalwood to calm inflammation and add a glow, I could go on and on. Its packaged in a cute reusable metal jar and comes with a small wooden spoon inside to help you scoop some of the powder out. The technique is super simple, just scoop about one heaping spoon of green powder into your palm or a small bowl, add a little water to make a paste and apply onto your skin. Leave on for 1-2 minutes and then massage the entire face with wet hands in upward circular motions, covering all the places where you applied makeup, including the eyes, and rinse off. Now it won’t remove waterproof mascara completely but if you use oil beforehand for any heavy makeup then you’ll be fine. For day to day use where you’re not using too much makeup it’s perfect, and does a double job of exfoliating and cleansing. My skin always feel amazing and soft afterwards, and sometimes I need a touch of moisturization for which I use a drop or two of coconut oil. So for days when I’m too lazy to cleanse my face with oil, or when I’m having a super rushed morning, I turn to this all natural substitute to get the grime off in a healthy, organic and, most importantly, soap free method. If you try this product let us know how it worked for you!